Sunday before last (18th) was a glorious November day. Blue skies, little wind with many walkers taking to the moors. I recall standing on Cliff Rigg and noticing the number of folk on Roseberry. But the scene was marred by dense black smoke coming from the direction of Newton and Great Ayton Moors. The periodic deliberate burning of heather moorland dries out the peat destroying the habitat and the carbon store built up over millennia. The moor is more susceptible to wildfires and less of a rainwater sponge thereby potentially contributing to flooding downstream. All in the name of maximising the number of grouse available to be shot. 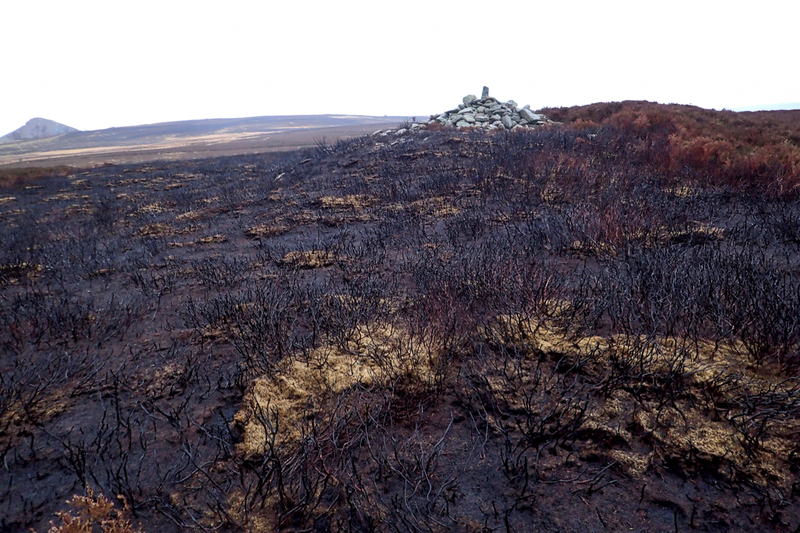 Following a European Commission threat to commence legal proceedings against the UK for allowing the practice of heather moor burning Michael Gove, the environment secretary, met with a small group of grouse moor owners in private and agreed with them to set a voluntary scheme to suspend the practice. Such a scheme is not legally binding and not all grouse moor owners have signed up. It does not appear that the owners of Newton Moor have signed up to the scheme. However prior to this voluntary ban a code for burning existed. The Heather and Grass Burning Code, issued by DEFRA and Natural England, specifically requires avoidance of damage to features of archaeological or historical interest such as Scheduled Monuments which are protected by law. Newton and Great Ayton Moors are particularly rich in burial monuments, field enclosures and clearance cairns. The cairn in the photograph stands on a round cairn, one of several Bronze Age funerary monuments. At least half this cairn has been subjected to the burning. I have walked on the moors for some years, at times shrouded in smoke. On one occasion I had to sympathise with American tourists who were finding it difficult to navigate their route as on every turn they faced a wall of dense smoke. They eventually had to retrace their steps and gave up on their walk. In the 1980s I regularly used to restore the standing stone on the highest point, only to find the next week it had been knocked over again. It was not a place frequented by walkers in those days but the tyre marks were a bit of a giveaway of other visitors. Despite being a regular visitor I can’t ever remember seeing anyone else. Did see some quad bike tracks early one morning after a fresh fall of snow. Glad to hear it’s still a relatively quiet spot. The gamekeeper would drive up onto the ridge from the Kildale track in his Land Rover, having a dog I always avoided them. Think it was Lord Gisborough’s gamekeeper from North Ings. Eventually won the battle and by the early 90s they left the stone alone.